Welcome to Ignition and Magneto Info for 1970s and 1980s mopeds, USA models with brake lights. Moped magnetos have two parts, a rotating flywheel/rotor, and a stationary stator. They have two functions, producing the source of ignition spark, and generating power for lights. Most magnetos worldwide have two functions that are independent and unrelated. The lights function independently of the ignition, and the ignition functions independently of the lights. The fact that the headlight comes on when the engine is turned over does not mean that the spark is good or bad, because head lights (except Angel/Speed Bird and Motobecane) are separate from ignition. Typical Stator Assembly: At left is an original 1974-1986 Tomos A3 stator, the stationary part of the magneto. Left is the points, right is the condenser, top is the ignition source coil (with two output wires, black and blue), bottom is the lighting source coil, with one output wire, yellow, at top right (not the yellow from condenser to points). The ignition source coil has an external ground (the blue wire), while the lighting coil has an internal ground (the solder joint at lower right). 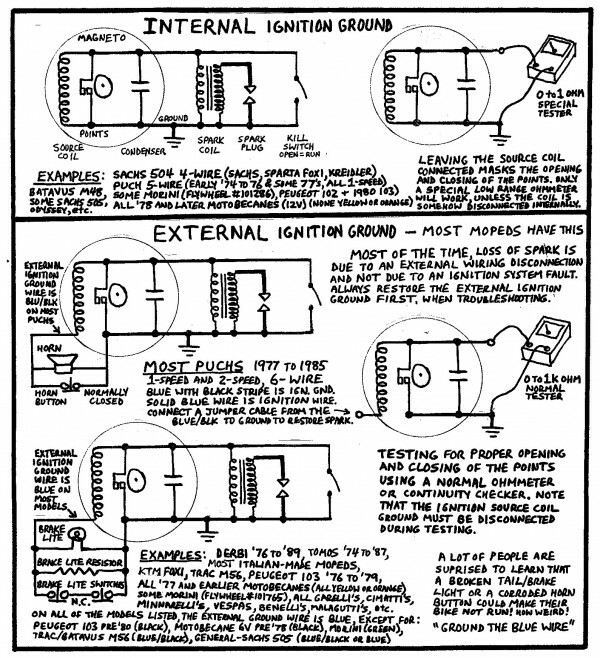 Below is another Myrons hand-out sheet explaining internal and external ground ignition circuits. This is a very useful troubleshooting technique. A condenser can be added temporarily without removing any parts. At left is a “Clip On Condenser” a valuable tool. When a running bike is having ignition misfires due to a bad condenser, this external condenser will reduce or stop the misfiring or “hiccuping”. It can be any older automobile condenser. It can be located anywhere along the wire that runs from the points, inside the magneto, to the spark coil outside the engine. It only takes a few seconds to “T” the condenser off the coil wire, clip the ground somewhere, and go riding. 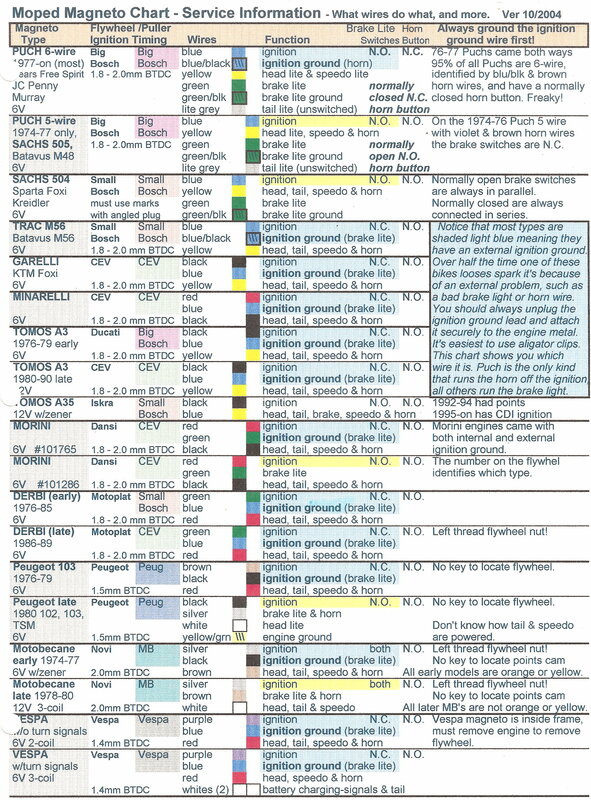 The Magneto Wires Chart above is like a master key that unlocks a lot of different mopeds. 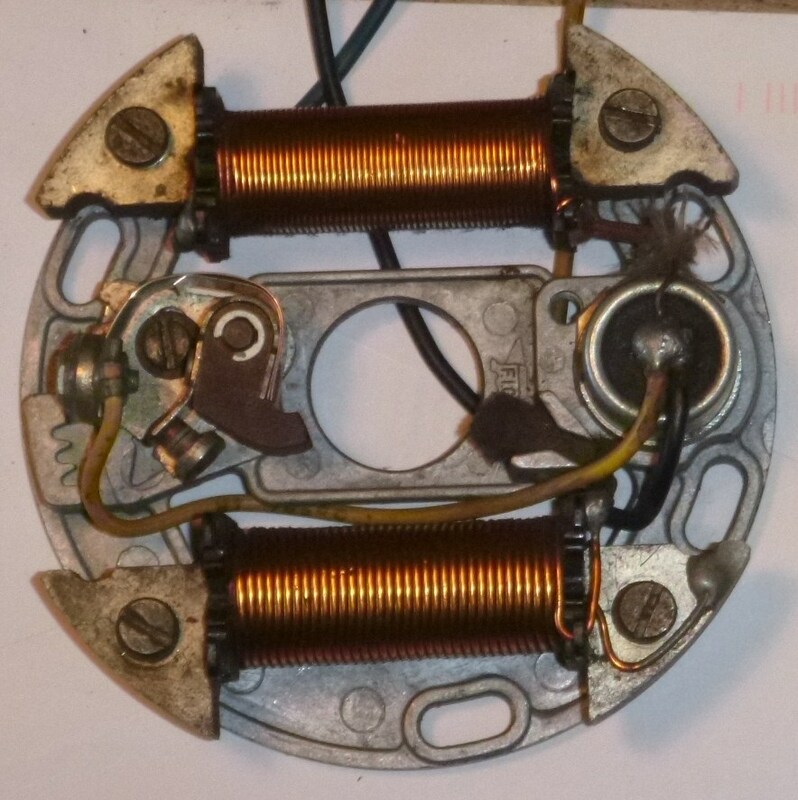 Knowing the color and function of the magneto wires allows a moped engine to be “hot-wired” to run without any of the bikes wires. “Hot wiring” is the same as making an engine run, say on a work bench, completely separate and disconnected from the bike. Certain magneto wires matter, and must go to certain places. Other magneto wires are for lights only. The ignition wire must always go from the magneto (points, condenser, and source coil) to the spark coil, and not also to ground. The ignition ground wire must always go from the magneto (source coil ground) to ground. You can make this happen easiest with alligator clips on the ends of wires, like little jumper cables, called clip leads. To make any moped motor run on a work bench, you need some clip leads, a spark coil, a good spark plug, and the knowledge of what each magneto wire does. For example, on most Puchs, blue is ignition, and blue/black is ignition ground. On a Garelli, black is ignition and blue is ignition ground. On a Derbi, green is ignition and blue is ignition ground. Sometimes the wire colors are faded to grey, dark brown, or black. Then slice some skin off with a sharp knife to expose the true color inside. You are currently browsing the archives for the Ignition Service category.